But with Pep Guardiola’s side having to face Tottenham and Manchester United in the next 10 days and Liverpool having no more matches against top six teams, Juergen Klopp’s side have a glorious chance to end their club’s 29 year wait for a domestic league title. 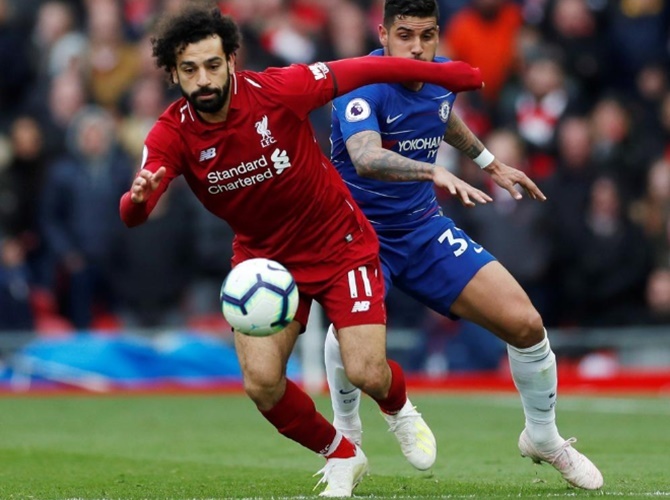 That did not come but with only lowly Cardiff City, relegated Huddersfield Town, Newcastle United and Wolves remaining as hurdles, this was the biggest obstacle in Liverpool’s run in, cleared with some margin to spare. “It’s really big,” said Liverpool skipper Jordan Henderson. “It’s another big game we have won. We have to concentrate on ourselves, work hard on training pitch and the focus is on the next game. But we are enjoying it and that’s the main thing,” said the England international. Hazard, playing in a central role, had been a constant threat in the opening half while Liverpool’s cutting edge was not quite there — Mane going close with a curling effort and a Firmino toe poke forcing Chelsea keeper Kepa Arrizabalaga into action. The pressure is on City ahead of 10 days which could determine the outcome of this fascinating title race. Manchester City forward Raheem Sterling struck twice as the Premier League champions beat Crystal Palace 3-1 at Selhurst Park on Sunday to go top of the table and heap pressure on title rivals Liverpool. Victory left City on 83 points from 33 matches, one point above Liverpool although the Merseyside club can leapfrog Pep Guardiola's team with a win over third-placed Chelsea later on Sunday. The victory was the ninth straight win for City in the Premier League. Having missed an easy chance early on, Sterling put City ahead in the 15th minute when he ran on to Kevin De Bruyne's inch-perfect pass from behind the halfway line and fired past goalkeeper Vicente Guaita. The England international added a second for his 17th league goal of the season after the break, meeting Leroy Sane's first-time cross into the box with a calm left-footed finish that wrong-footed Guaita as it rolled in. "We controlled the ball really well but one moment in the game and they are back in it. But we responded again and got the third goal," said Sterling, who added his belief that the title race will go down to the wire. "100 percent the way Liverpool have been playing. It will go down to the wire. I don't see us slowing down now. Liverpool have a great squad, great self-belief, but so do we," said the former Liverpool forward. Pep Guardiola's side now face a crucial ten days starting with a home game against Tottenham Hotspur on Wednesday in their Champions League quarter-final second leg, trailing 1-0 from the opening game. City then play Spurs at the Etihad again, in the league, on Saturday before the Manchester derby at Old Trafford on April 24.